These socket head cap screws are stronger than your grade 8 bolt. Rated at 170,000 psi tensile strength. We plate our socket cap screws zinc II yellow for rust resistance. These socket head cap screws are stronger than your grade 8 bolt. Rated at 170,000 psi tensile strength. We plate our socket cap screws zinc II yellow for rust resistance. These socket head cap screws are stronger than your grade 8 bolt. Rated at 170,000 psi tensile strength. We plate our socket cap screws zinc II yellow for rust resistance. These socket head cap screws are stronger than your grade 8 bolt. Rated at 170,000 psi tensile strength. We plate our socket cap screws zinc II yellow for rust resistance. Fully threaded up to 1 3/4" long. These socket head cap screws are stronger than your grade 8 bolt. Rated at 170,000 psi tensile strength. We plate our socket cap screws zinc II yellow for rust resistance. Fully threaded up to 2" long. These socket head cap screws are stronger than your grade 8 bolt. Rated at 170,000 psi tensile strength. 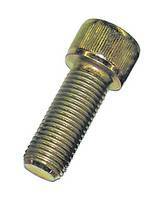 We plate our socket cap screws zinc II yellow for rust resistance.